Coming up with fundraising opportunities to engage your donors year-round can be tough. But it’s definitely worth taking this extra step, as organizations that fundraise year-round benefit from consistent engagement and loyalty from donors throughout the year. If you host only one or two large fundraising events per year, you’re missing out on the opportunity to capitalize on several smaller (but still incredibly valuable) fundraising opportunities throughout the year, such as empowering your supporters to fundraise on behalf of your organization for their birthdays or during the holiday season. The following ideas will help you keep your donors connected to your cause all year long. An awesome way to fundraise throughout the year is peer-to-peer fundraising. One of the major problems with fundraising only running fundraisers on specific dates during the year is that people won't necessarily have the funds to donate to your cause on these dates. With a peer-to-peer fundraising model, you allow a flexible schedule for donors or individuals who are interested in your cause the ability to donate whenever they please. Using this model can also help avoid “donor drain,” as more people other than just your normal loyal group of donors will have the opportunity to contribute to your organization. Setting up a fundraising page can also empower your supporters to create their own pages to fundraise on behalf of your organization. This helps widen your donor network to include your supporters as well as their networks, which inevitably will ease the burden off of your organization’s most loyal supporters. 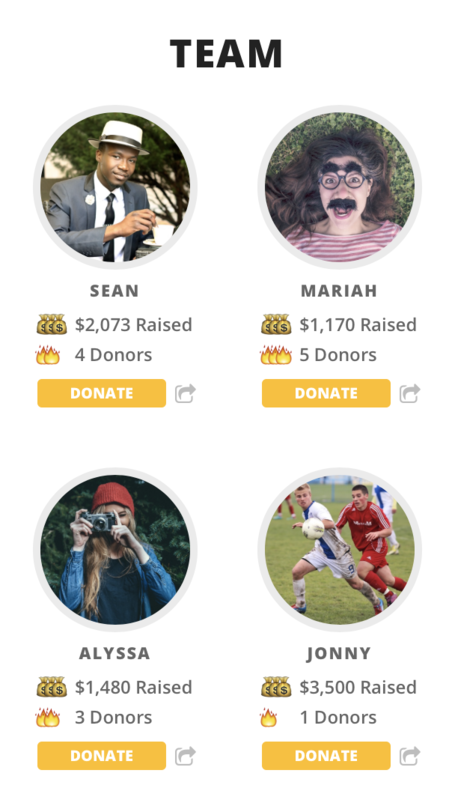 You can turn this into a competition of sorts by using the Givebutter team fundraising feature, which provides your members with individual trackable fundraising links that they can use to get credit for the donations they bring in to your campaign. With this added sense of competition, you can empower your team to reach a larger audience ready to support your organization. One of the best ways to ensure a steady flow of donations throughout the year is to create a recurring donor campaign. Make donating effortless for your supporters by setting up an automated payment system on your organization's website or on your social media profile page. By establishing a permanent place where donors can easily contribute to your organization, you will be setting yourself up to receive donations at all times throughout the year. If you have an event planned for a certain date, build up hype over time by starting an online fundraising page for the event months ahead of time. Setting up this page will help you gauge the amount of engagement that you can expect from the community at your event, as well as help fundraise donations in addition to the money that will be raised at the event. This an easy opportunity to gain support from Millennials by reaching them where they are: online. Don’t place all of your focus on your crowdfunding campaign--build a strong presence on as much of the social media landscape as you can. And don’t just stick with Facebook and Twitter. If you’re looking to reach young donors, Instagram and Snapchat are vital to the success of your campaign as well. According to the 2016 Millennial Impact Report, 71% of Millennials had already raised money on behalf of a nonprofit and 13% would be willing to if they were asked. Building a strong social media presence can be a fantastic way to connect with new, young audiences. Once you build a strong network of supporters on social media, you can ask for their support with fundraising campaigns throughout the year. Build a steady stream of donations around the clock during the times when people feel the most inclined to give: birthdays and holidays. Set up an interactive section on your website where your supporters can enter their birthdays, and request donations (to your cause) instead of gifts from their friends and family by using email reminders and social media posts. This method works great for holidays as well. When you promote your organization year-round, you’ll reap the benefits of creating a steady influx of donations throughout the year, and maintaining an engaged and loyal network of supporters. You’ll make fundraising effortless for your donors with recurring donor campaigns, reach new donors through your social media profiles, and never miss an opportunity to bring in additional donations by empowering your supporters to raise money for your organization on their birthdays or during the holidays. With these ideas and the support of the Givebutter community, there’s no reason not to start creating more year-round fundraising opportunities.